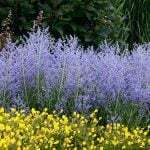 With summer festivities and holidays rushing toward us, there is no better time to stop and think about how you want to enjoy your outdoor space this season. Me? I love Steve’s margaritas… or a glass of red wine. A good craft beer in the heat of the summer works too! With outdoor spaces being extensions of the indoors, DIY outdoor bar ideas just seem like a dang good plan. And if you don’t prefer to serve alcohol, use your DIY bar to serve the best iced tea around! The Bar Is Open! Let’s start off with this amazing outdoor bar idea from ‘Remodelacasa‘. 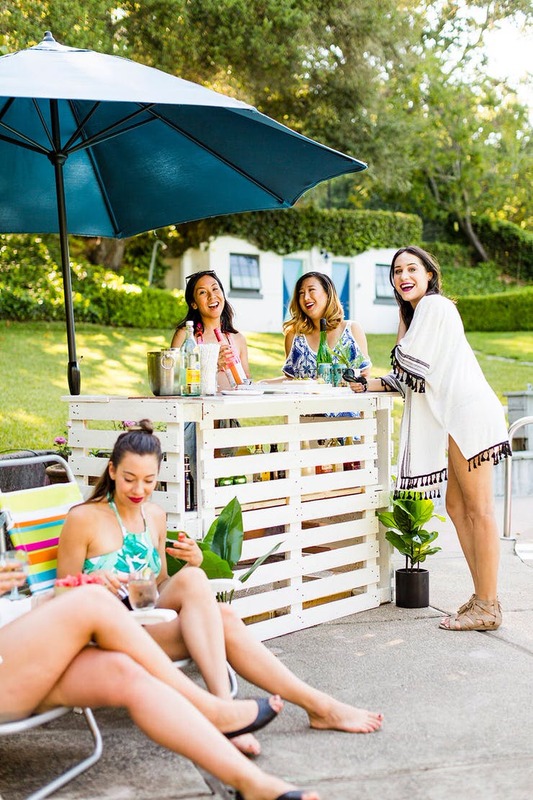 This DIY bar has the perfect vibe for an outdoor party, for five people, or fifty! Easy to follow tutorial, and you have to go check out what she used to make a towel rack on this bar. Total charm! 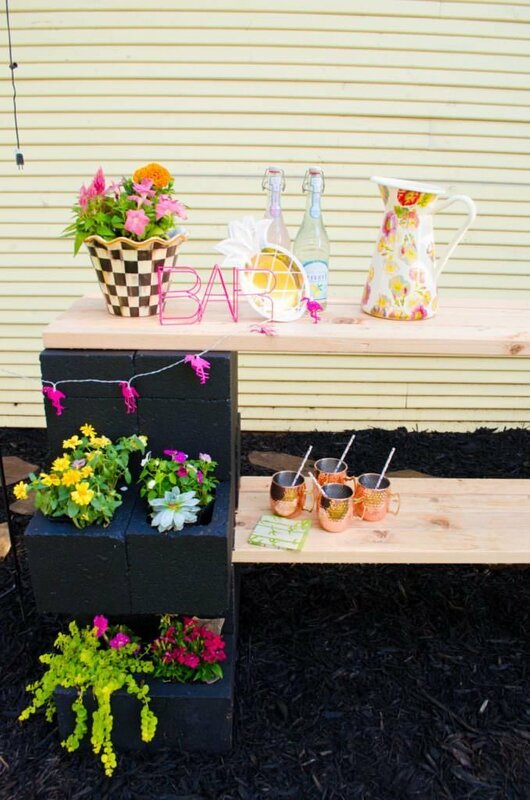 If a cool cinder block planter and an outdoor bar had a baby, you would get this funky DIY bar from ‘Kristyn Cole‘. Love this creative idea for a patio or pool space. And it’s a bar on a budget! From ‘Homemade Modern‘, this minimal take on the outdoor bar idea has a full video tutorial so you can make this for your backyard. 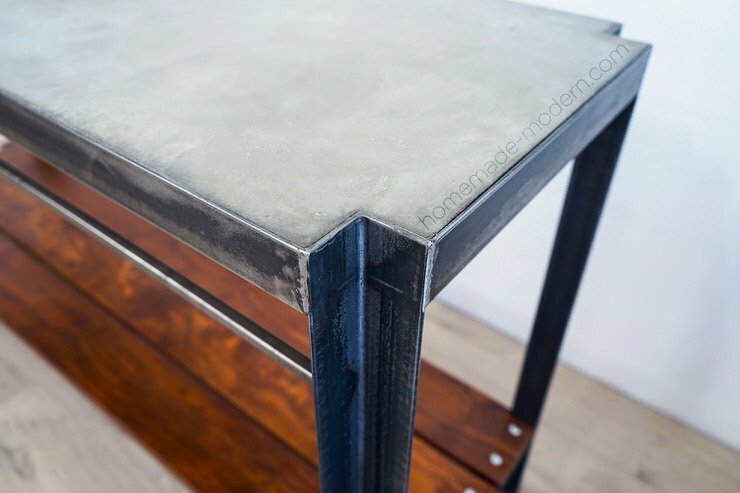 We love the concrete top. This. Is. Cool. 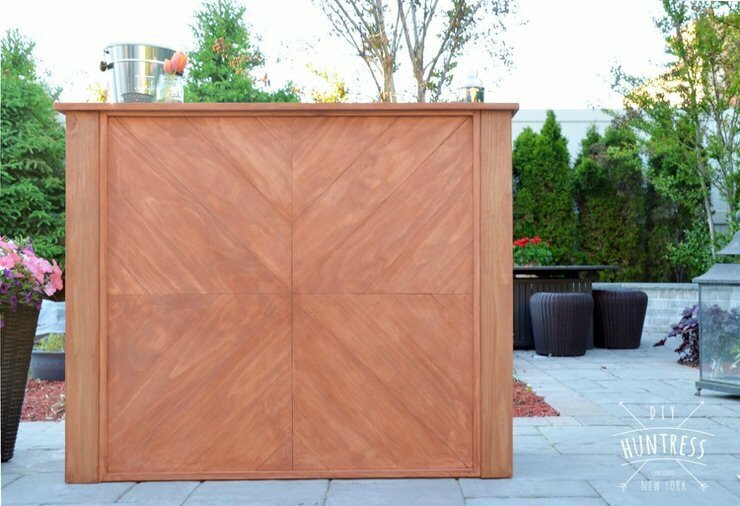 Ok, now this wooden outdoor bar looks like it belongs poolside at a high end hotel, right? Margarita anyone? From ‘DIY Huntress‘, these DIY bar plans are free to download, and you can make your own bar that looks like this. That wood is amazing, and she promises it will hold up to weather! 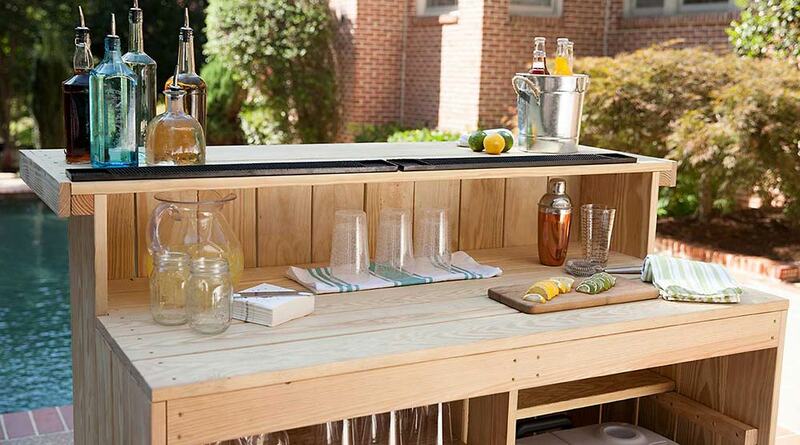 This outdoor bar idea is perfect for the entertainer, because it has space for a cooler as well. This is a DIY bar with complete step by step instructions, and is so pretty! From ‘Yellawood‘. 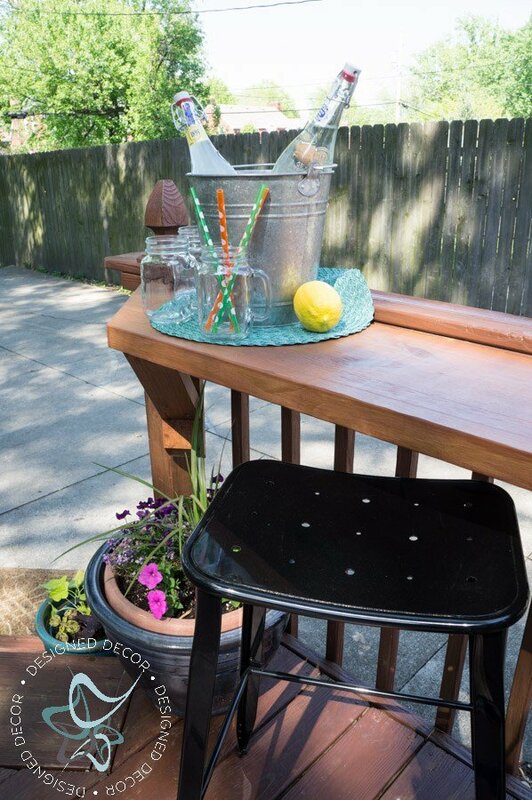 So, say you have a tiny outdoor space, but you want to be able to have a bar to entertain… Learn how to make a DIY Murphy bar! This folds up when not in use. Genius! Tutorial from ‘Hunker‘. 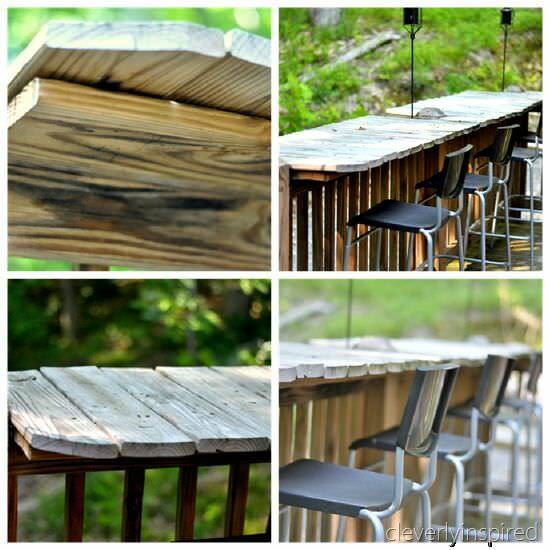 A Pinterest inspirational outdoor DIY outdoor bar idea. 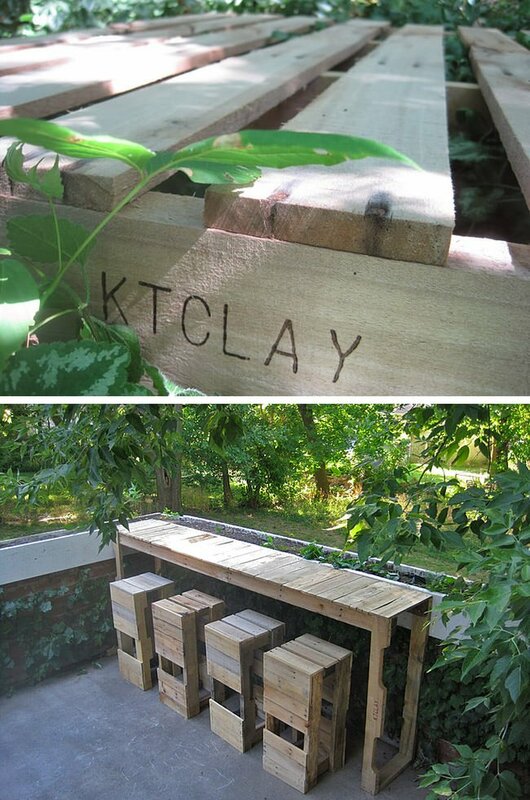 This one is pretty easy…attach two pallets together with screws, paint, then top with landscape pavers. 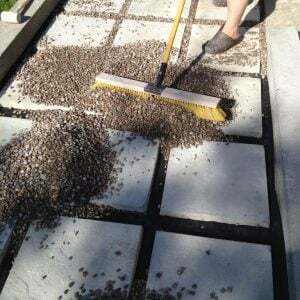 Pick up some landscape adhesive at Home Depot and attach the pavers permanently for safety. Done! 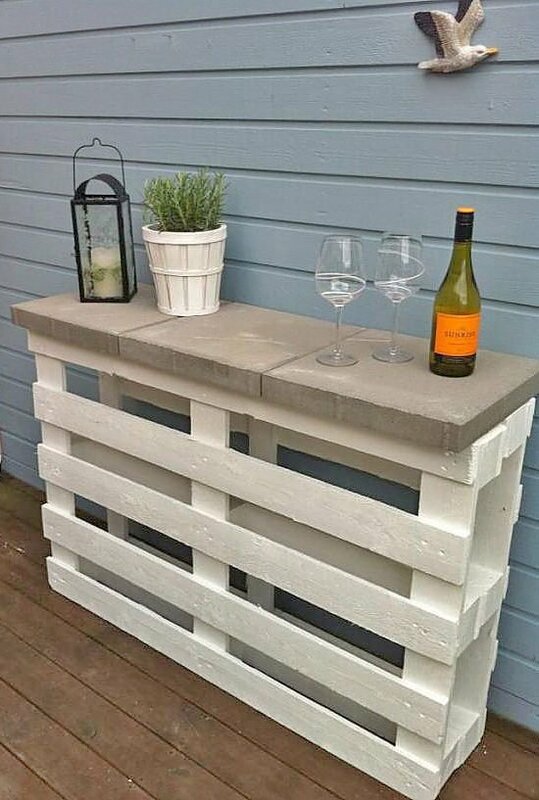 ‘Stacked Design‘ has a tutorial with tons of photos for this DIY Pallet Bar. And bar stools. 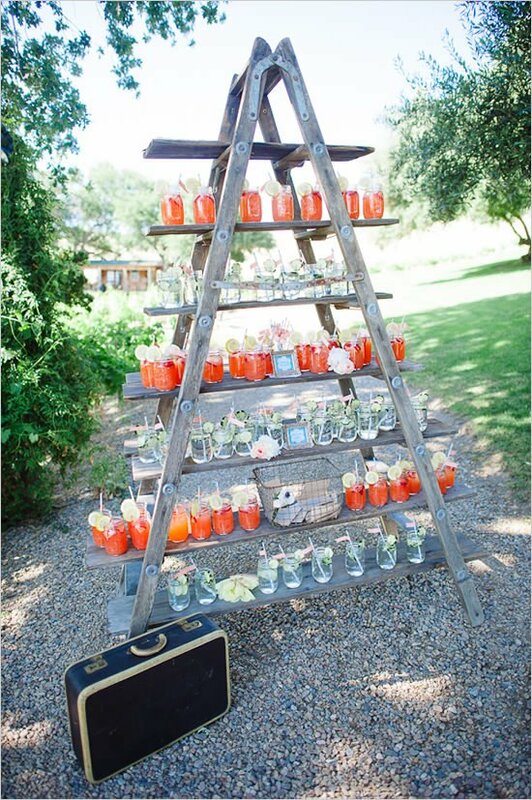 We know these pallet ideas can be a little controversial, but we love this one! 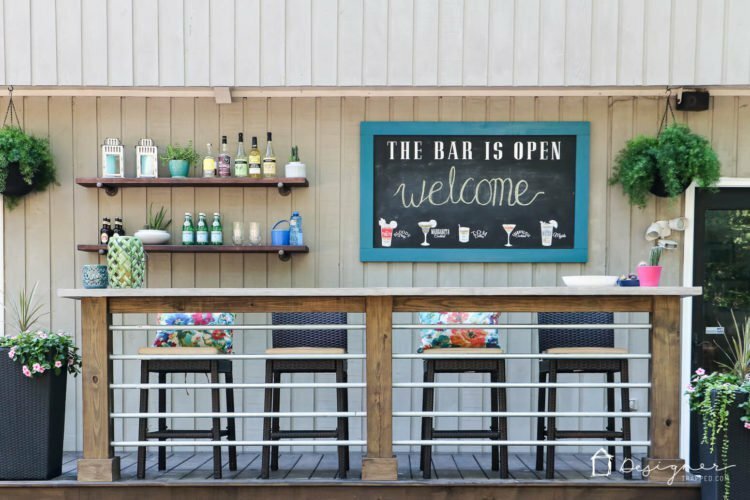 ‘Cleverly Inspired‘ shows you how to build an outdoor bar, using their deck railing. Great use of space! 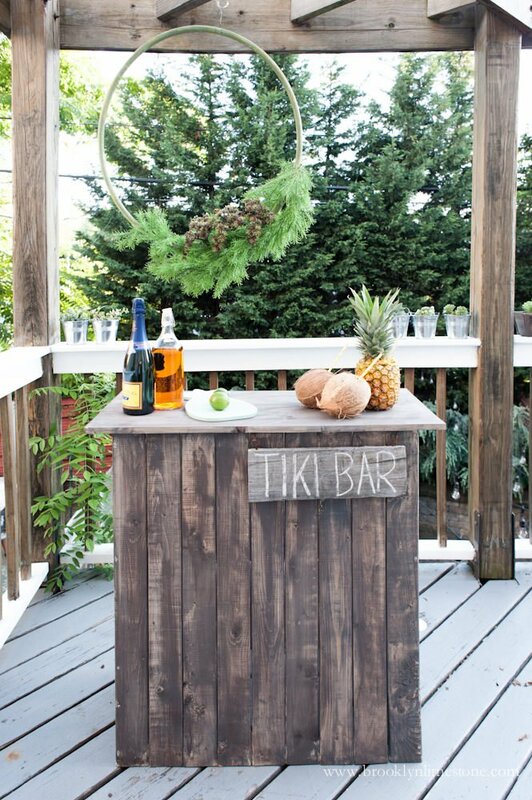 How can you not fall in love with this cute DIY Tiki bar from ‘Brooklyn Limestone‘? 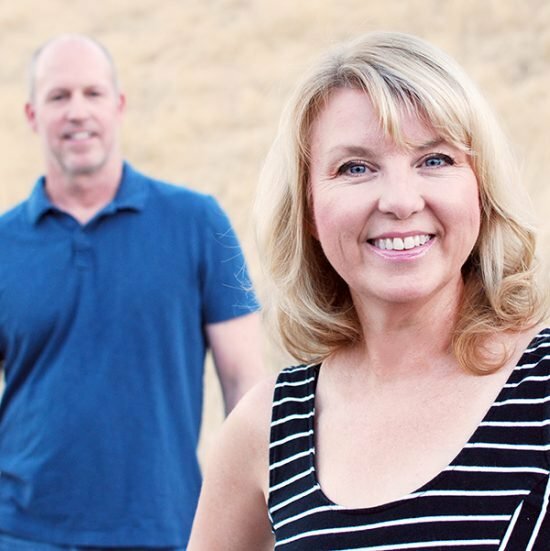 If you have the home improvement store cut the wood, the only tool you need is a drill. Have the most fun backyard on the block! 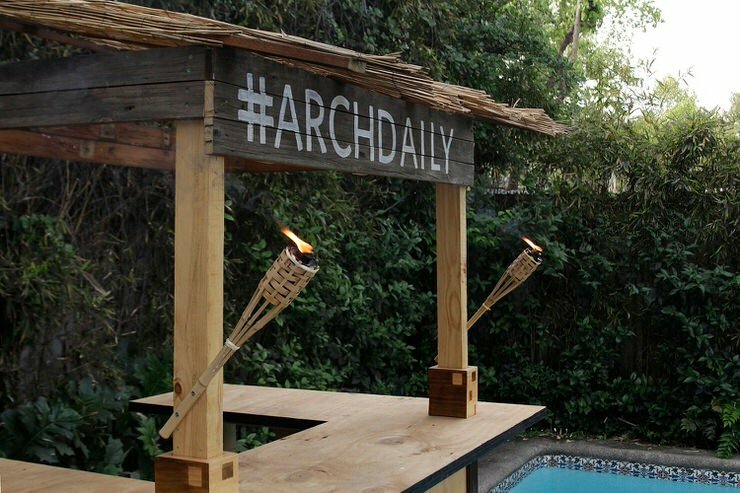 Here is another take on the DIY Tiki bar from ‘Arch Daily‘. This one is a little larger, and we love the tiki torches mounted to the front of the bar. BTW, is you want to make your own, check out our post on DIY Tiki Torches too. If you have a deck, chance are, you have the perfect spot to build an outdoor bar. Using the height of your deck rails, you can create a bar that doesn’t take up too much space, and adds a whole new reason to lounge on the deck! Our first outdoor bar idea for decks is from Tanya at ‘Designer Trapped‘. This bar on a budget is so pretty, we included two different photos so you could see all views. Love it! 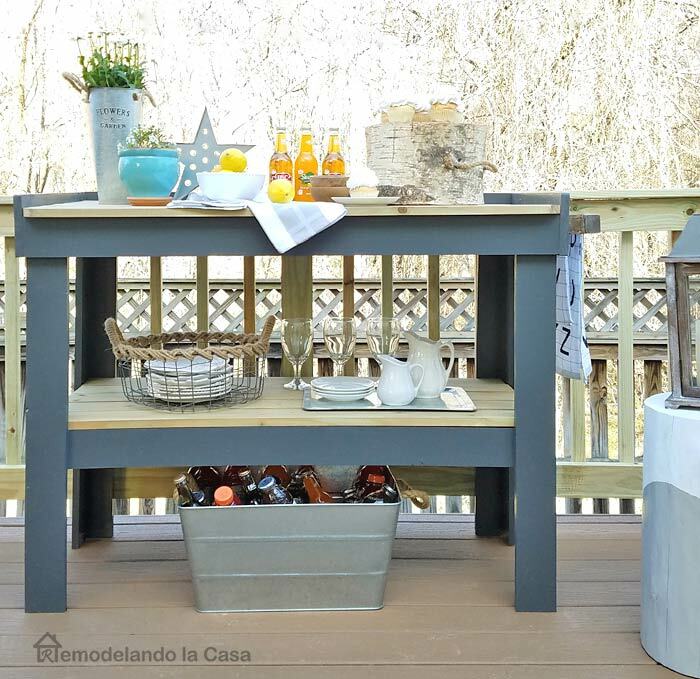 ‘Designed Decor‘ has a brilliant space saving idea for a deck… a flip up DIY outdoor bar! When you aren’t using this, it flips down out of the way. Lots of great tips on how to build this bar. 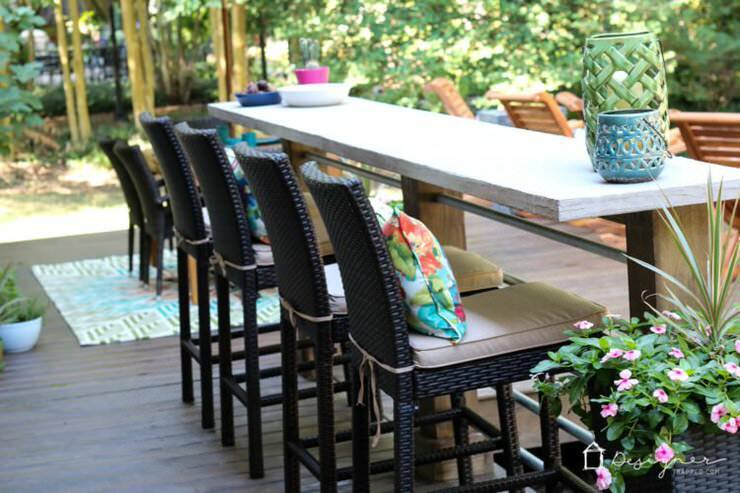 This outdoor bar idea from ‘Fiddle Leaf Interiors‘ is right next to their hot tub, turning it into a party. I mean, come on! A good relaxing soak, and cocktails? 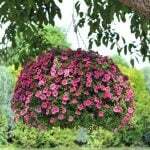 Step by step photos and instructions. Lastly, here is an idea that couldn’t be simpler. 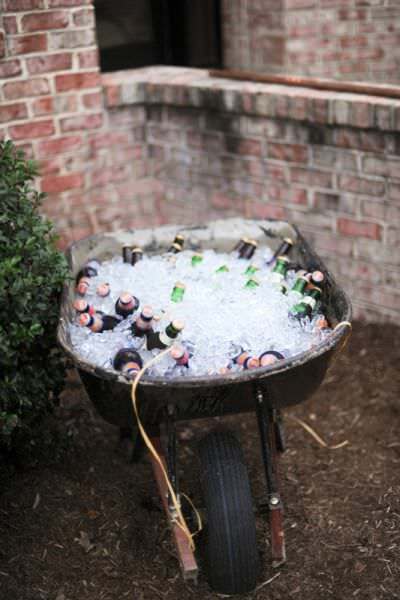 What more festive way to share drinks than an ice filled wheelbarrow? And, it’s like a portable outdoor bar! You know, for when the party moves from the patio to the lawn for the inevitable football “game”. 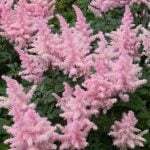 From ‘Style Me Pretty‘. 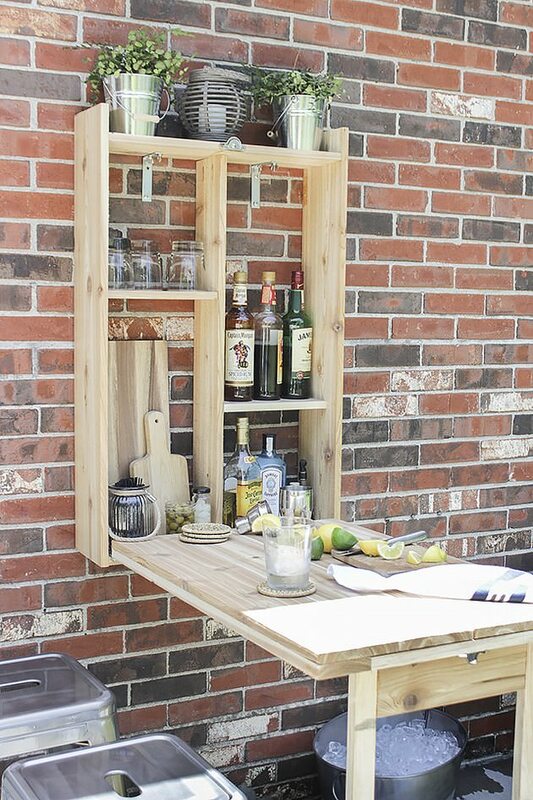 We hope you loved learning how to build these DIY outdoor bars! 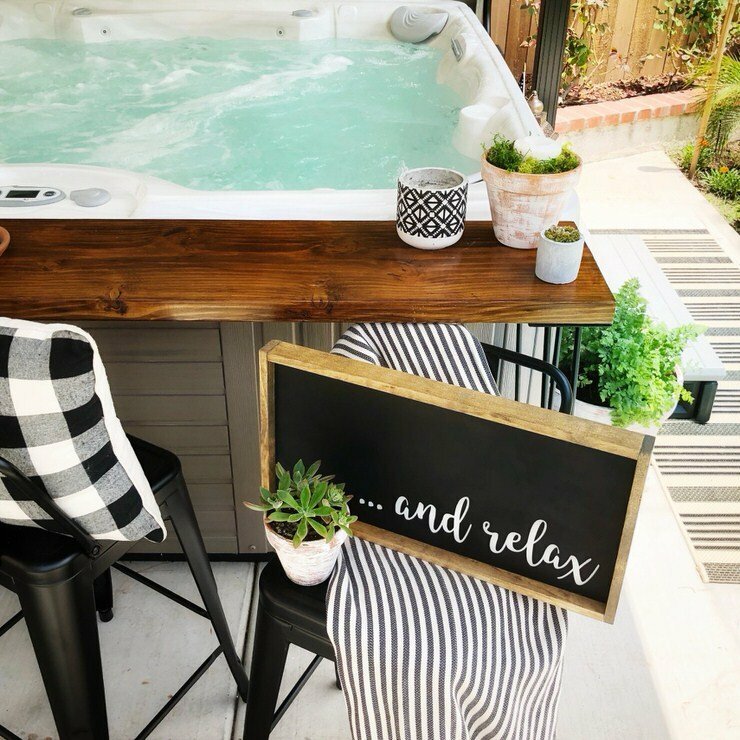 We know you will want to jump right on over to either DIY Patio Privacy Screens or How to Build a Backyard Movie Theater! Has anyone put wheels on this? I need to be able to move it on occasion. I get as many pallets as I want from work and in all different sizes … with that said I am looking forward to building some of these for my home !!! If I didn’t have it against a wall, would it be too top heavy to have it free standing? In the pallet bar project, I like the seagull attached to the house. How would you suggest doing that? I would assemble your pallet base first, then measure where you want the paver “top” to overhang, then get pavers in that size! very good !! 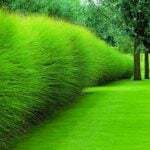 Trop bien ! For the bottom bar that uses two pallets screwed together and the pavers on top, what size pallets were used? Thanks! A standard pallet is 40″ x 48″. The height of a standard kitchen counter is 36″. What size pavers did you use? You would have to write the original poster of the project you were asking about, each project has a link back to the instructions where you can find that contact info! What did you use to connect them? and how? I am at that point with mine now. They’d have to be 16″ x 16″ since 3 of them fit perfectly across a 48″ counter.